← Don’t be so quick to judge! It is funny, the only home in our family where there really is an official sandbox, is our house. That is a win for us because it is a great pull. 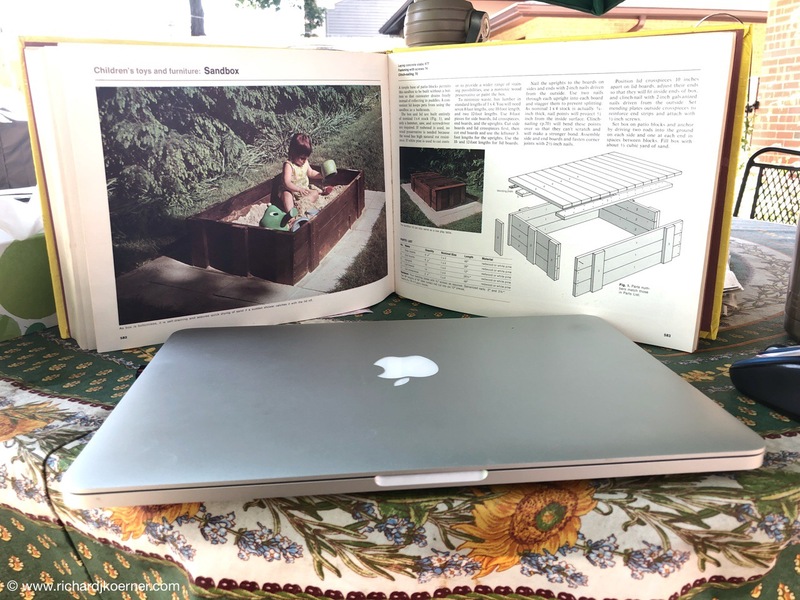 Years ago, when the funds were less expansive, I made our own sandbox, having seen a plan for one in a Reader’s Digest Book I own. I built it easily and stained it to a redwood look. I remember as well talking to our Hungarian friends who immigrated here from after the war. Dr. Tatar was an ophthalmologist and he and his wife, Maria, had escaped Communism and ended up in Highland Park. One of their sons married a good friend of ours that we had met in grad school in Ohio. Our raspberries and currant were from them. Besides that, we got many an idea about gardens and about life. One of the things that struck me was that Dr. Tatar reminded me that if we had a sandbox, that it must be covered. Uncovered sandboxes, as he told me, were sources of a disease spread by cats, one of them is toxoplasmosis. This wreaks havoc with humans and can even cause blindness. In any case, the choice of sandbox I made was with four low sides in the shape of a rectangle, and covered with a wood top that fit right over it. The good thing was that when closed, it could be used as a table. The fact that it was generally closed meant that raccoons, feral cats, and outdoor cats, could not use or mistake this for a litter box. In any case, the kids love the sandbox and for some reason, I know not why, they love to put the sand in a little shovel or pail and dump it elsewhere. My first reaction is to tell them, ‘No,’ but then I realized that putting small amounts on the grass is not a problem, nor is it for the brick pavers, since we need sand between the cracks. With the grass, I disperse it a bit; with the pavers, I just sweep it in. No sense in getting bent out of shape when they are actually doing something that is good. This entry was posted in Grandkids, Life in general, People and their characteristics, Thoughts and philosophy. Bookmark the permalink.